Five marlin from a kayak in a single day...an incredible effort. “On the way out I managed to catch several large slimies and began trolling a top line on the spinner and a bait at 20 m on the downrigger and overhead. This continued uneventfully for about 3 hours before the downrigger line popped the clip and the rod bent over in the holder. “Shark” I thought, but then the line stretched to the surface and a marlin jumped. “At this time, the top line clip pinged and this rod also doubled over. I flipped the spinner bail and cranked up the downrigger bomb on a now unsteady kayak. Two marlin were now jumping in opposite directions as I adjusted the spinner drag. I chased the first fish as the other reel gave line. Doing this kept both lines tight and amazingly both fish stayed opposite each other as they jumped over the ocean. Several times I feared that I would end up swimming but I eventually tamed the first fish and released it. It was a great feeling to then pick up a fully loaded rod and play out another still energetic marlin. Both fish appeared to be in the 35-40 kg range. 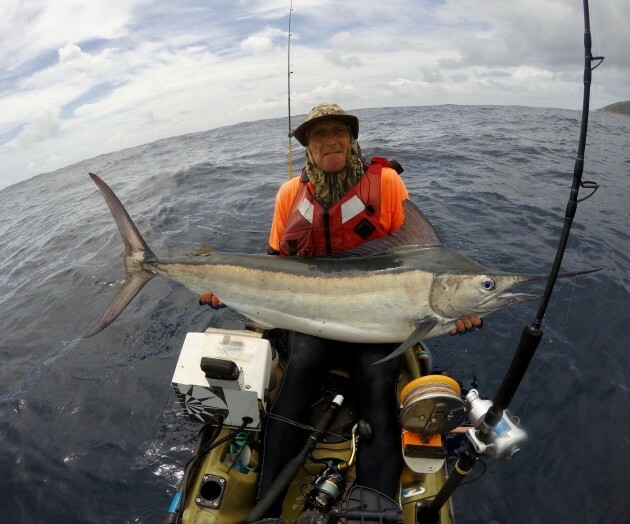 “The next fish came off the surface and was in the 70 kg range. It only jumped a few times and mostly slugged it out down deep. After what seemed like ages, I got it to the side of the kayak and released it. “All this carry on had taken a lot out of me but I now had 3 fish in one day, my personal best, and 4 fish in 3 days. Suddenly this put me in reach of making 50 billfish out of the yak. This was a target I had become fixated on a few years ago, but which seemed more elusive the harder I tried. “I rebaited and shortly after hooked another 70 kg fish. This one was very spirited and jumped many times before I released it. I like it when they jump a lot as it takes the edge off them and makes it less tiring for me. “I was becoming very tired by now. My water had run out and I hadn't brought any food, not expecting to be out so long. I was now only one fish short of my 50 but my slimies had all gone and I’d had enough so started to head in from 2 km out. I had only gone a few hundred metres when bait showed up on the sounder. Old habits prevailed and I dropped a Sabiki for one small yakka. I bridled it up on the top line and continued in without any great expectations. Congratulations Grant and all the best for a speedy recovery.